Categories are simply an organization method that groups together your keywords. You can set them up in anyway you'd like. You can group together a client, a site, or simply mix any URL/keyword combination in a category. You can also schedule email reports or share individual categories. 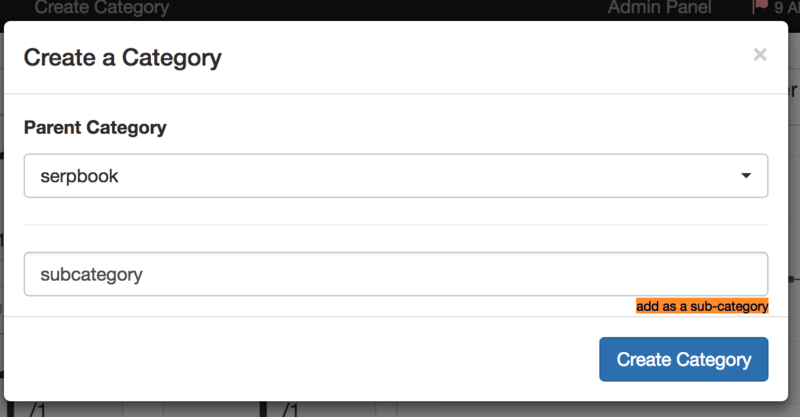 Categories are automatically created once you've added your first keyword. Clicking on "Your Categories" at the top of the page will allow you to see a list of all the categories you have. You must have at least 1 keyword in the category for it to 'save', otherwise it will disappear. You can add a category as a subcategory by clicking on 'add as a sub-category' when adding in a new category. Please note, as mentioned earlier - that the parent category must have at least 1 keyword in the category for it to 'save', otherwise it will disappear. A subcategory will contain the [sub] text to indicate it's a subcategory. This will create a main category 'Category 1' and two subcategories underneath that as Subcategory 1 and Subcategory 2. Be sure to enable this setting to "Include" sub-categories in parent categories within the settings. How do I Merge Two Categories?